* Annual estimated passenger usage based on sales of tickets in stated financial year(s) which end or originate at Devonport from Office of Rail and Road statistics. Methodology may vary year on year. Devonport railway station serves the Devonport area of Plymouth, Devon, England. The station is 1.25 miles (2 km) west of Plymouth railway station on the Cornish Main Line. It is operated by Great Western Railway. The station opened with the Cornwall Railway on 4 May 1859. It was described at the time as "built of rubble masonry, in the Italian style of architecture, which style is adopted at all stations on the railway. It consists of an arrival, departure, and goods stations, the two former being stone structures, and the last a wooden erection". In 1865 the Royal Agricultural Show was held at nearby at Pennycomequick and so the opportunity was taken to enlarge the platforms at Devonport. A "refreshment booth" was also erected for the duration of the show to cater for the large number of visitors expected. The Cornwall Railway was amalgamated into the Great Western Railway on 1 July 1889. The Great Western Railway was nationalised into British Railways from 1 January 1948 which was in turn privatised in the 1990s. For a while after 1948 the station was known as Devonport Albert Road to distinguish it from the ex-London and South Western Railway Kings Road station (now the site of the City College Plymouth). The name reverted to just "Devonport" from 6 May 1968. The goods shed was originally situated in front of the station near the tunnel entrance, but a new goods yard was opened in about 1892 on a larger site east of the station. This was accessed beneath a girder bridge that carried Valletort Road. The old goods shed and sidings were removed in 1903 and replaced by new sidings which handled milk traffic until 1957. Valletort Road goods depot was closed in April 1957 and was then used for about forty years by the railway civil engineers. The station became unstaffed from 19 May 1969. The station was initially controlled by disc-and-crossbar signals controlled locally. The first signal box opened on 9 November 1877, a 20-lever box with semaphore signals, but it was extended in about 1892 to 29 levers to accommodate the new goods yard at Valletort Road. The signal box was replaced by a new one in October 1899 when the line was doubled to Keyham. It closed on 26 November 1960 since when multiple-aspect signals have been controlled by the panel signal box at Plymouth railway station. The station is in a cutting at the top of an incline which climbs up from Plymouth. Immediately to the west of the station the line curves sharply to the right and enters a short tunnel. The entrance is on the platform served by trains to Gunnislake and Saltash. 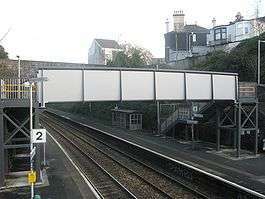 The second platform that is served by trains to Plymouth is reached by a footbridge. To walk to Devonport, turn right out of the station, right again over the tunnel. On reaching the main road the shops and Dockyard are down the hill to your left. Torpoint Ferry can be reached by turning left out of the station and then following the park down the hill. To walk to Stoke, turn left out of the station and at the main road turn left again. Devonport is served by Tamar Valley Line services from Plymouth to Gunnislake,and also by certain trains on the Cornish Main Line to and from Penzance, some of which continue eastwards beyond Plymouth towards Exeter St Davids. The Lounge pub near Devonport station takes part in the Tamar Valley Line rail ale trail, which is designed to promote the use of the line. The line is also part of the Dartmoor Sunday Rover network of integrated bus and rail routes. ↑ MacDermot, E T (1931). History of the Great Western Railway, volume II 1863-1921. London: Great Western Railway. ↑ Cooke, R A (1979). Track Layout Diagrams of the GWR and BR WR: Section 12, Plymouth. Harwell: R A Cooke. ↑ Crozier, Larry (2000). Mechanical Signalling in Plymouth. Wallasey: Signalling Record Society. ISBN 1-873228-18-X. Wikimedia Commons has media related to Devonport railway station. Mosley, Brian (December 2006). "Devonport Albert Road Station". Encyclopedia of Plymouth. Plymouth Data. Archived from the original on 23 August 2008. Retrieved 13 February 2015. Smith, Martin (1995). An Illustrated History of Plymouth's Railways. Caernarfon: Irwell Press. ISBN 1-871608-41-4.